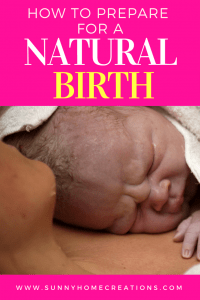 So you are wondering how to prepare for natural birth. Well, I have several tips for going through labor and delivery drug free and as pain free as possible. If you decide not to read this article all the way and want to have a natural birth, my number one advice is to make sure to PREPARE! Truly, prepare yourself. Mentally and physically. You will need it and it is possible to have a natural pain free child birth, but only if you prepare yourself ahead of time. Before we get started – I just want to make sure you know that I am not a midwife nor a doctor. This is all what I would do and have done personally. I am not giving you medical advice. Make sure to talk over everything with your doctor. B. make sure to ask for an epidural as soon as we got to the hospital to make sure we’d have enough time to get it. Fast forward many years to when I was pregnant with my first son. I remember mentioning to a few family members that I had planned on not getting an epidural and having a natural childbirth. The reaction was pretty much along the same lines. None of the comments I received were helpful or supportive. Nobody, except for my husband and a few online friends at the time believed I would be able to go through childbirth without begging for an epidural. I strongly believe that preparing for a medication-free birth is essential to make the chances that you stick with not asking for an epidural more successful. And if I can do a medication-free birth, then you can too. With my first son, I used hypnobirthing. We joined in on some live classes that took place about an hour drive from where we lived. We would frantically drive over there after my husband got home from work a couple times per week. In these classes, our instructor would talk with us about what to expect, show us some birthing videos, help us practice going into a hypnotic state and in general give us some advice and support about how we could do this and ways to make it work for us. After going to these classes for several weeks I heard about the Hypnobabies Self Study Course from some online friends. The more I read about Hypnobabies, the more I wished that is what we had done, but we were really close to giving birth at this point and I didn’t have the money to spend on another program, let alone enough time to go through the program. With son #2, I did the Hypnobabies Self Study Course. He was overdue by pretty much exactly 2 weeks. The midwives (except for one) were all in a panic about him being overdue. There was a lot of testing and a LOT of pressure for me to be induced, which I refused to do. When I finally did go into labor, it was totally pain-free. I could feel the contractions (or pressure waves) and it was super cool to have my hands on my stomach and feel how tight it would get for each contraction. There was no pain for the contractions, just pressure. Because of the worries about them wanting to induce me so bad, I was worried that I wasn’t truly in labor. Especially since I didn’t have any pain, it just felt like painless Braxton Hicks. So I stopped listening to my CD’s and started doing some stuff to make sure I was for sure in labor and that the labor would continue. This was a mistake, as once I started feeling the contractions it was hard to get back to my “zen” state. Although, I was able to totally decrease the pain by listening to the CD’s again, doing the “finger drop” and trying to relax as much as possible. One of the things the hypnobabies course goes over is the pain/fear cycle. The more fear you have of the pain, the tenser you become and the more tense you are the more in pain you are in. If you are relaxed on the other hand, the pain isn’t as bad and can even be gone. The book does a really good job of explaining this cycle and it totally made sense to me. I’ve heard many people say they couldn’t be hypnotized so the programs (hypnobabies and hypnobirthing) wouldn’t work for them. These programs both have a lot of good information and ways to go through labor and the how’s and why’s of a lot of labor and birthing as well. The CD’s are more like guided meditations and train you to be ultra relaxed while in labor. One of my all time favorite baby accessories was my nursing pillow(s) – yes, I had multiples. I used one almost everytime I nursed my babies. You can get a nursing pillow for free at www.nursingpillow.com, just use the coupon code “SUNNYSAVE40” at checkout. 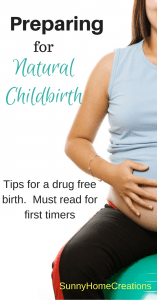 So here are my best how to prepare for natural birth tips on how to have a drug free labor and birth and have it as painless as possible. Prepare! I said this above and I’ll say it again – make sure to prepare! Read as many birth stories as you can about POSITIVE natural birth experiences. See what works for others and is practical for you to try when you are in labor. I strongly recommend having some sort of program to use to get through labor and delivery. I highly recommend using Hypnobabies. I used the Self Study Course and I would listen to my CD’s each evening, which made my evening very relaxing. It is such a wonderful program. It uses a lot of visualization, there is a great fear release meditation on the cd’s, plus all the other great cd’s that come with it. I 100% believe that the birth of my second child would have been totally pain-free if I wasn’t so worried about being induced and listened to the cd’s the whole time. There are other programs out there too, so do some research. Read birth stories of people who have used programs you are interested in. Drinking red raspberry leaf tea is a great way to prepare. Red raspberry leaf tea is supposed to be good for getting the uterus muscles in shape and help make labor shorter. I started drinking this tea a few months before I went into labor with all of my kids and I think my labors were quicker because of it. My first son was my longest labor at 8 hours and that is considered really quick, especially for a first-timer. Pub-Med did a study on red raspberry leaf and the use of it in pregnant women. Water – they don’t call water nature’s epidural for nothing! HOT showers were my best friend when in labor. That is where I spent the majority of time while I was in labor. Some hospitals have birth pools, but if you want to be in a birth pool and you plan on birthing at a hospital, you need to find out this information ahead of time as well as how to get into a room with a birth pool. When the time comes – RELAX. When a contraction/pressure wave hits, try to relax even more. Make sure your belly is as relaxed as possible. This is hard to remember in the moment, so it helps to have someone who can remind you if you need it or do Hypnobabies and the cd’s will talk you through it. Hypnobabies also has you practice relaxing as part of their program beforehand, so it becomes easier to relax specific parts of your body. Consider hiring a doula. A doula will support you during your birthing time and is well versed in knowing what might help you be more comfortable. If there is pressure to be induced, make sure the induction is validated. I don’t have evidence of this, but I’ve heard from many people that contractions when on Pitocin are super uncomfortable – much more than normal labor contractions. If there is a medical reason you need to be induced, try natural induction methods first. If a large baby is suspected, this isn’t necessarily a reason to induce and especially not a reason to induce before 39 weeks gestation. With my first, the midwife who delivered my baby guessed how large he would be when I arrived at the hospital in labor – she guessed 2 pounds smaller than what he was. With my second and third, the ultrasound machine said they would be heavier than they really were. With my second, it was over a pound difference. There is no way to know exactly how large your baby will be. If you are uncomfortable when laboring, change your position. Lying on your back in bed isn’t the most comfortable way to go through labor. Walk, go on all fours, squat, bounce on an exercise ball – try different labor positions to see what feels more comfortable to you. Everyone’s birth experience is different. If you hear about someone else’s story that isn’s positive, remind yourself that story was her experience. It isn’t and doesn’t have to be your experience. If you are planning to have a hospital birth, read up on what to expect at that specific hospital. Talk to people that have had birth at the specific hospital you are going to be going to. Different hospitals have different procedures. Some are more natural birth friendly than others. If you don’t like what you hear about the hospital (make sure to talk to more than 1 person), see if you can give birth at a different hospital or a birth center. Make sure you have a midwife/OB that you can trust. If you want to use a midwife and are going to be birthing at the hospital there are a lot of good hospital midwives. Ask questions and make sure you are OK with their procedures. If they routinely do something that you don’t want, ask them if they are OK with doing it how you want it done. If you don’t trust your care provider or if you aren’t OK with how they do things, look for someone else. Even if you are later in your pregnancy, most likely you can still change providers. Try to do it quickly though, so you can start to build your relationship with the new provider. Take walks/exercise. Make sure you are staying active while pregnant. Your pregnancy will be easier and so will your labor and recovery. Even if all you do is take a walk each evening, make sure to do it. Make sure your pregnancy diet is full of healthy foods. Make sure you are getting enough fats (good fats – like from avocado’s, coconut oil, etc) and protein. When your body is healthy, it will have an easier time getting through childbirth and recovery afterward. Say positive birth affirmations. If you need help coming up with some, these ones are wonderful. Stay at home to labor as long as possible if you are having a hospital birth. You want your contractions to be long and strong before heading in. The typical advice is contractions happening every 3 to 4 minutes and then it’s time to head in. I will say – with my second and third, I called my Mom to come watch my kids the second I thought I might be in labor. She came right away each time and both times I almost didn’t make it to the hospital. My labors are short and quick. Part of this is knowing your body and trusting your gut on when to go in. I created a birth plan with each of my kids. I changed a few things with each birth but kept most of it the same each time. It made me feel better knowing that the hospital staff would know my plans without me having to tell them. I also read up on everything I thought I would possibly need to know beforehand (I still needed to know more than I had read about). There is now a cool app that walks you through creating your own birth plan. Remember, with a birth plan, that sometimes things don’t go according to how you want it to, so some flexibility is needed. You can totally have a natural, drug-free birth and delivery! If I can do it, you can do it. If you liked this post, I’d love for you to “PIN IT“! Women who opted for a natural birth has a lot of preparation to make. not only that they need to prepare the things they will need but they have to prepare their entire self physically, emotionally and mentally.